I’m super excited to have the opportunity review the Simone France “Handwich” and Soft Hand RX products. I am one of those scattered women that runs out the door and remembers last minute to put her gloves on. Then reaches into her pocket and only has one. Consequently, I have dry hands. Dry hands hurt, peel, crack, and sometimes even lose a bit of their feeling towards the cold. I being a female, and wanting healthy looking hands turned to Simone France for some help. 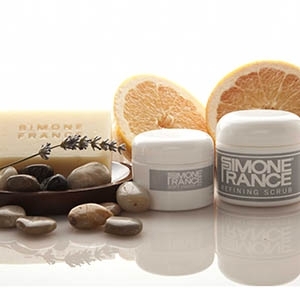 Their “Hanwich” and Soft Hand RX products from Simone France are amazing and go above and beyond what they say they will do. I received the following products for review. This spa treatment for your hands. This has certainly helped my hands from looking dry and cracked to soft and smooth. I’m now fancying painting my nails and going all out. A reason why this system worked for me? It’s super easy to use. 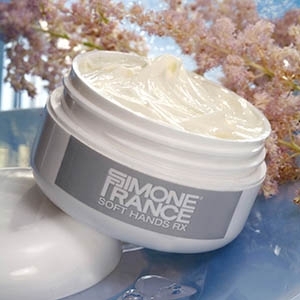 Simply Apply Soft Hands RX to dry hands taking special care on your fingers, apply Refining Scrub and massage. Add a few drops of water to soften the scrub if desired. Over the moisturizer and scrub, apply a lather of Soap and rinse thoroughly. Finish by applying Soft Hands RX to protect hands for the day. This treatment works instantly. It didn’t take a lot of time for my hands to start feeling the difference. They looked and felt good with in minutes. I really love companies and founders with a story and Simone France is one of those companies. Simone France was seventeen years old, living with her parents in Paris just after World War II. Like so many young women then and now, even though she had the most beautiful skin, when she looked in the mirror, all she saw were flaws. Simone was fortunate to be living in Paris where there were so many beauty institutes and experts available. She went from one to the next to the next. They all had the same approach, promising her fantastic results and pushing her to sign up for a series of costly treatments using the latest, greatest ingredients and methods. Not one of them did much of anything for her. After a long search with no real results, she finally knocked on the door of a wonderful professional woman who was very encouraging in her approach and who recommended a simple treatment. Not only did her advice ring true to Simone as soon as she heard it, but over time her skin completely recovered. This experience led to a decades-long career in skin care and a sincere desire to help people. She learned how easy it is to mislead people and she vowed to always tell the truth and never make empty promises. She may have the skin of a baby at 80 years old today, but she never forgot what it felt like to have a face full of serious skin problems. She developed a product line and method based on common sense and results she could plainly see on the faces of thousands of real women, famous and not famous, who came to her every day for advice and treatment.